Related: British Airways You may recognise the afternoon tea pictured above which is offered on British Airways European Business Class flights. I quite like sandwiches and British Airways are apparently bringing back the British Airways scones and cream soon so I enjoy thier afternoon tea offering (although admitedly, the sandwich is a relatively meagre bite if you are hungry). Our Travel Auctions Sort Bypopularlatestending The good news is that British Airways have ditched it’s current rather average caterers and are bringing in talented and highly accoladed caterers to replace them. Gate Gourmet and DHL at Heathrow and Alpha at Gatwick are being chucked and DO&CO are being bought in, one of the best airline caterers in the business. They are responsible for catering on Austrian Airlines which offers some of the best long-haul airline food in the sky. 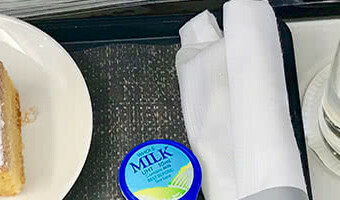 That said, our reporters recently flew a flight in First Class on Singapore Airlines in a suite and found the food to be … [Read more...] about British Airways Launching Better Food On Your Next Flight!